We have arrived! The 12th century stone facade "portal of glory" is under scaffolding in rehab. 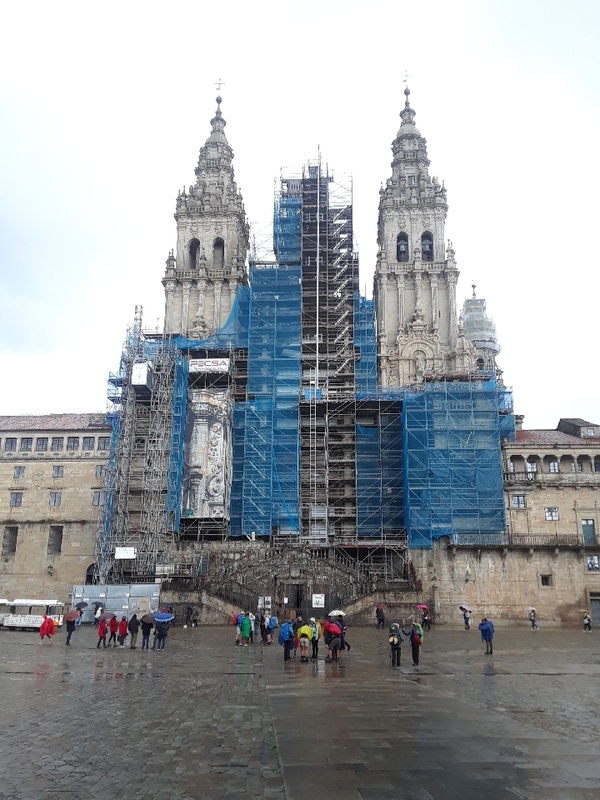 So I guess we'll need to do another Camino to see it in its fully restored glory. We entered through a side door and had to reorient ourselves to get the full effect. Mon Dieu, I was not prepared for the altar canopy! Holy moly, larger than life angels, bucket loads of gilt goldenizing. Then, of course, there are probably 10 side altars, each packed with its own array of saints and devotions. A few are very medieval, many are more ornate Baroque. All are gorgeous and would be a front altar in their own right. Click here for images of the Catedral de Santiago. Completed. So much to be grateful for 22 days and 545 km to think about it. We went to the noon Pilgrim mass the next morning and saw the Botafumeiro Ritual, the Santiago de Compostela Incense Burner. Mike took a video, but this video is much better, and it's from the side so you can really see it swing. (We were lucky enough be able to stand in the main part of the church.) To say it was awesome and incredibly moving is an understatement. Super excited to have clothes washing in a machine not a hotel basin! Our apt flat is less than a block from The cathedral in the very old part of town. The queue to get our final Compostela was pretty long, but fun to be there with all the wet and tired people! Got some Padron Peppers and other snacks after. May meet with some fellow pilgrims after a shower. 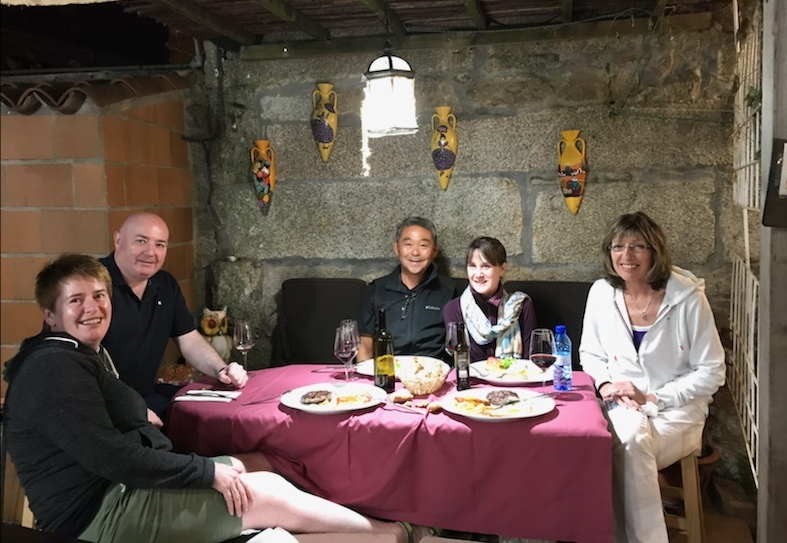 This is a pic from our dinner in Tui a few nights ago. The French woman Florence is on the right, that's Fiona (Irish) on the left, and their newfound friend Brian (also Irish) on the left. Our wonderful flat, just a stone's throw from the cathedral. 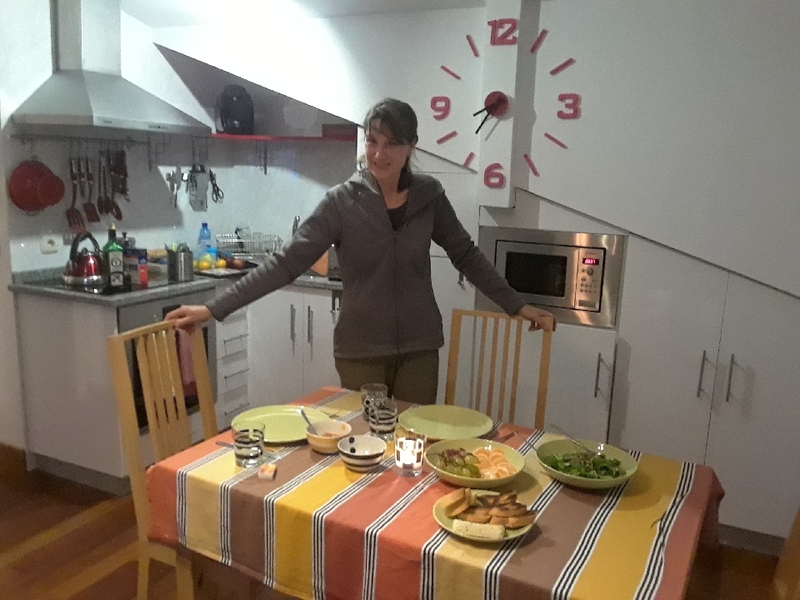 And supper in for once! Tomorrow off to meet Alexa! !